The annual ALR cabin-fever, winter get-together at Ft. Boonesborough State Park, Ky. will be held on January 26, 2019. We will meet in the blockhouse from 9am to 4pm, with a break for lunch at Hall's on the River. All ALR members and anyone that's interested in the study, building, shooting, etc. of long rifles, horns, bags, knives, etc. is welcome. Please bring works in progress, recently completed pieces, antiques for discussion, items for sale or trade. In past years we've had from 10 to 15 attendees, but we can accommodate more, and we always have a great time, so please come and join us. We usually try to have some tutorials or demo's lined up, so if anyone has any tips or how-to's they would be willing to pass along, please let me know. I'd like to get a rough head count, so I can let the Fort know how many tables and chairs we need, so please let me know if you think you will be attending. I'll be looking forward to seeing y'all at the Fort. Life is too short to hunt with an ugly gun. Count me in. I’ll bring a couple of those guns from the Roughton collection and my new favorite Brooks gun. Maybe a few other surprises. I'll try to make it. Maybe if I make it you guys won't hide from me this year. Ron, I’m planning to make the drive from Pike County, as long as Ma Nature doesn’t toss us a monkey wrench. If I get time, I’ll weave up a few horn straps in case anyone needs one. I hope to be there and look forward to it. You can count me in, Ron. I'm new to this with no projects, but looking forward to learning from you all. I wasn't able to attend last year. I will be there this year. I was afraid of that, I’ll be at a wedding that day. Daggummit I always look forward to these. Say hello to Mr Farmer for me, maybe next year. I'm planning on being there. My brother-in-law is pretty sick so it will be a wait and see thing. Its always a fun time. Ron, I plan on attending as well. Seems I heard the John Curry has a rifle shop at the fort. Maybe he and David Coleman could arrange a quick tour? Johns shop is at Fort Harrod. Well I've been waiting to see if one of my coworkers could trade with me to get off that day. Looks like she can, so I plan on being there. It's great to hear from everyone. Sounds like we're gonna have a good crew. The more the merrier! Brian, I promise we weren't hiding from ya. David R, sorry we'll miss ya. Kiss the bride for us! Daryl, sure, bring your stuff. Really looking forward to seeing everyone. Should be a great time. Only 10 days away! Looking forward to it. Nothing special we need to do—just go to the reconstructed fort off 627 right? Yes, we will meet at the Fort. We are usually in the blockhouse in the northeast corner of the fort. If you are working on a project, or recently completed one, bring it along. If you don't have a project going, maybe you will pick up some ideas. 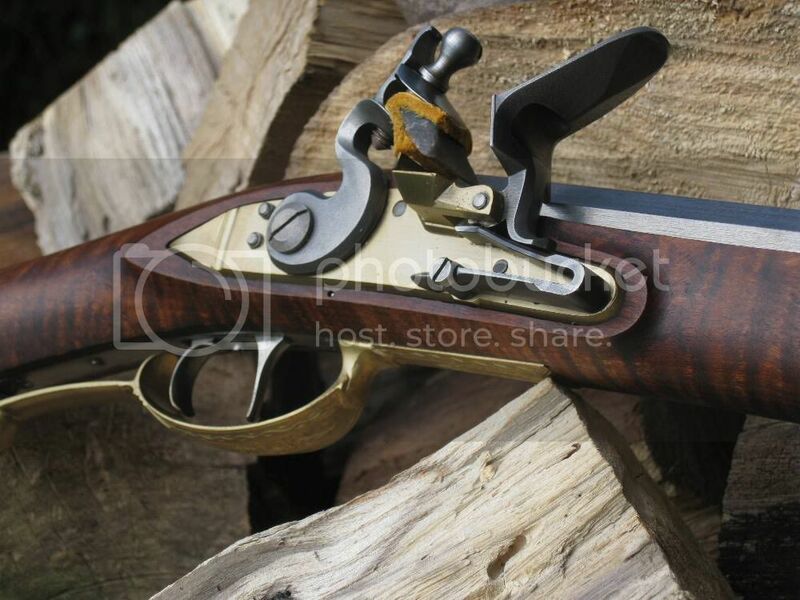 All that is required is an appreciation for the longrifle. I plan to attend and have a friend tagging along. Looking forward to it...looks like the weather might be decent! Thanks Ron. No project yet...just an interest in the craft. I am considering stopping by the event, but there is no guarantee. Ill be getting off at 0700 that morning, but depending on how busy the previous night shift has been and how tired I am will dictate if I feel like stopping. Just incase I will throw in my knives that I am putting together for the Lake Cumberland Show. University Policing on Friday nights is typically super busy with the partying and drinking. Great! Will be good to meet you. Dare I say it? The weather forecast does look good, no mention of wet stuff, but will be cold. I'll have a fire going in the fireplace. Then you will be most welcome. Maybe it will be cold enough to keep the yahoos in check. Stop in if ya can. We'll have coffee. Lookin' forward to seeing everyone. I’ll be there with 3-4 nice rifles. Looking forward to seeing y’all!